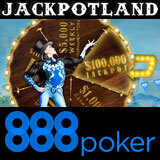 The 888 Poker Jackpotland promotion offers players the chance to win up to $100,000 cash by spinning the jackpot wheel. 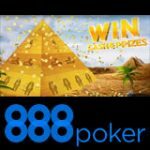 There are also four daily free Jackpotland tournaments with a $3,000 prize pool and a weekly $5,000 Jackpotland freeroll on 888poker. New players can signup and get three free tickets or complete daily challenges to earn your tournament tickets to the Jackpotland tournaments. Spin the wheel and win up to $100,000 everyday during the 888 Poker Jackpotland promotion which runs until 23rd April, 2017. Once you deposited and have played in any Jackpotland tournament you be eligible to complete daily challenges to get additional tournament tickets. Simply complete up to three challenges per day to claim up to three Jackpotland tournament tickets. 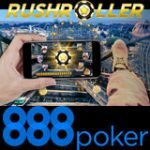 BLAST Poker - Play five or more BLAST poker tournaments with a buy-in of at least $1. 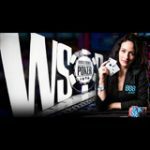 Poker tournaments - spend at least $4 on tournament and SNG buy-ins. Cash games - Win fifteen poker hands playing cash games of stakes of 2¢/5¢ or higher. 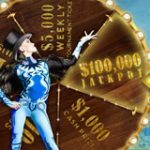 The top 500 players in any $3,000 Jackpotland tournament will also get an extra free spin on the Jackpot wheel. 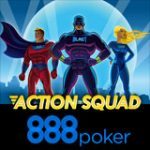 The jackpotland tournaments are all-in tournaments, players are required to register for the tournament but don't have to be present to play as players are all-in every hand. Players can get tickets to the weekly $5,000 Jumbo tournament by winning them on the jackpot wheel.